From left to right, Writing Center reader Zachary Harrington, coordinator Megan Ward, readers Carrie Dunklow and Diane BairAfter the busiest fall semester in NMC Writing & Reading Center history, students returning to the second floor of Scholars Hall will find more elbow room for wrestling with rhetoric, structure and argument. One argument that seems to be settled, as evidenced by the 1,750 student conferences held last semester: Writing well matters, long after that English assignment or history paper has been turned in. 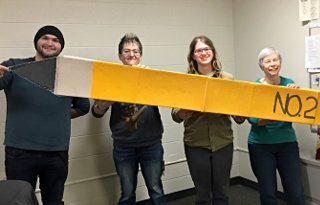 “The overall trend is that people recognize communicating, writing, being able to express yourself is important to a lot of different disciplines, a lot of different jobs,” Center coordinator Megan Ward said. Kevin Schlueter, president and CEO of Kalkaska Screw Products and a mechanical engineer by training, said it’s a key skill the company’s 116 employees need. 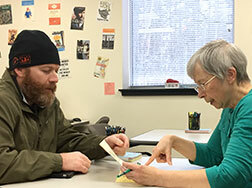 Student Gene Ward of Traverse City and Writing Center reader Diane BairIn addition to that awareness, Ward has a two-part thesis about why visits to the Center jumped 15 percent last semester, precipitating an expansion of the space over winter break. Every semester Ward emails all faculty to remind them of the critique services some 12 paid peer readers offer free of charge. Two years ago biology instructor Laura Jaquish was one of the more untraditional instructors to invite Ward to talk up the Center to her students in person. “With our 100-level classes, people are often not aware of what’s available to them,” said Jaquish, who found that her Plant Biology students benefited from the one-on-one critiques. She plans to refer students in another class, Essential Biology, this semester. Other Science & Math students, Computer Information Technology, and economics students have also found their way to the Center, which has expanded its hours into the evening and also off-site, to Osterlin Library on Sundays. “There’s a lot of writing being asked of students,” Ward said. History instructor Tom Gordon has long recommended the Writing Center to his students for the objective scrutiny readers can offer. “When you’re writing, it’s really easy to know what you mean,” Gordon said. When a reader doesn’t, it opens the door to improvement. Learning to improve is easier when the space is inviting, and that’s what Ward has aimed to create. Over Christmas break a storage closet was converted, expanding the Center’s footprint by about a third. Ward says the Center’s prized couch, which encourages students to linger, will likely move into that section, as well as computers. Then, students can begin incorporating feedback into their revisions immediately after the conferences conclude in the original section of the space. In conclusion, expect more record-breaking semesters at the Writing & Reading Center.